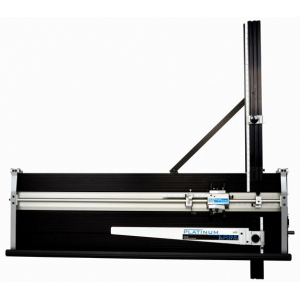 * The new Logan Platinum Edge Model 850 Mat Cutter has it all! * Starting with the aluminum-anodized base, this cutter is solid from the ground floor. * Featuring super-smooth cutting head glides, 4- and 8-ply cutting capability, quick-change magnetic blade cartridge, micro-adjustable moving magnetic stop, 32" (81cm) removable scaled squaring arm, and heavy-duty all-metal construction with aluminum base. * Use Logan Replacement Blade Model 267.